Long weekends for me usually mean I spend at least one day birdwatching, so I happily took the chance to go to Zealandia today. As usual here are my best photos of the day, I only had a couple of hours of sunshine before the clouds came over which made the dense forest quite dark, but I saw so many birds, even though I didn't get all that many great photos. There were several Kaka hanging around by the feeders, I loved watching them play fighting and being generally hilarious. 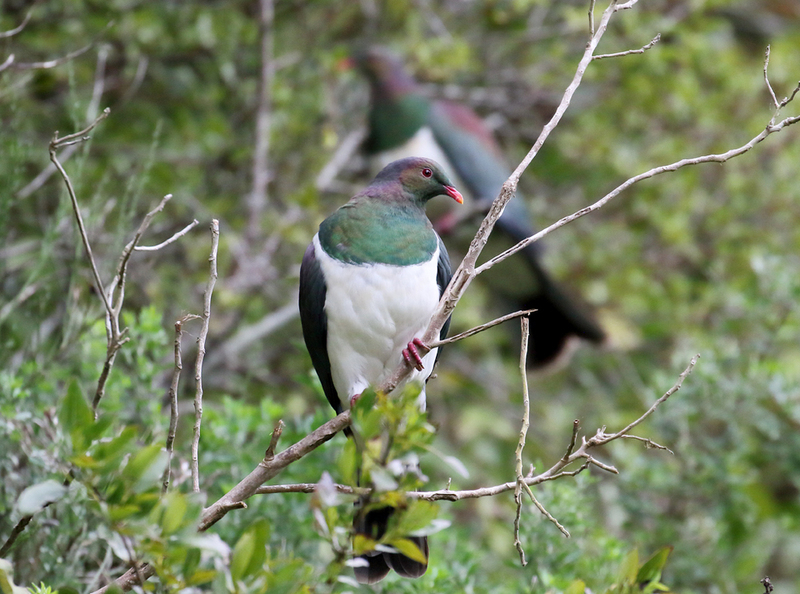 I saw a lot more Kereru than usual, these two were hanging around by the start of the walkway to the sanctuary, and didn't seem to mind people stopping to admire them. As usual there were lots of friendly Robins. And a few noisy but shy saddleback. I was lucky enough to have this Stitchbird land directly in front of me, as I was watching some Whitehead, I love those white ear tufts. The Whiteheads are always fun to watch, especially this fluttery young Whitehead begging its parent for food. The shags were out enjoying the sun in the morning, there are quite a few young ones to watch, they are quite clumsy and learning to spread their wings. I think the few hours of sunshine was all the sunny weather I'm going to get for the weekend, so I'll be spending the rest of the weekend inside doing some drawing, I've been working away at some new bird-art and will be sharing that soon!